Prospects for real estate investment trusts (REITs) are sluggish as there are fewer Grade A office buildings for sale in Greater Kuala Lumpur. As such, Rahim & Co managing director Robert Ang reckons there will be fewer REIT launches this year. 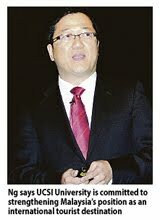 "REITs look at investments of above RM100 million. However, there is no good stock in the market. If there are quality assets, most developers will hang on to them as an investment, and probably float their own REITS," Ang said. "What you have in the market now are assets for sale by trust funds who are cashing out," he said after a briefing on the Malaysian property market outlook in 2011 in Kuala Lumpur yesterday. Ang said developers may take up property investment as a side income because of scarce land for new projects. Nevertheless, he expects more launches this year compared with 2010, with prices for landed residential properties increasing by 5 per cent to 10 per cent in choice locations. But he cautioned that ordinary investors are staying out of the market. "Fundamentals are not strong for foreign investors to come here. There is oversupply of condominiums in Kuala Lumpur. The vacancy rate is 30 per cent and rentals are softening. I do not foresee a major price increase for the next one to two years," he said. Ang said developers are still launching condominiums in Kuala Lumpur despite an oversupply situation and sales have been brisk as prices are 20 per cent less from the peak. Meanwhile, Rahim & Co founder and executive chairman Datuk Abdul Rahim Rahman said the Malaysian property market will do better this year, led by projects under the Economic Transformation Programme. Abdul Rahim expects more demand for residential, commercial, industrial and retail properties. He said projects like the Sg Buloh land and Sg Besi airport redevelopment, the Matrade project by Naza Group, the Kuala Lumpur International Financial District and the 100-storey tower by Permodalan Nasional Bhd will contribute to growth in the property sector over the next few years. "There would not be a nationwide phenomenon of property bubble," he said.